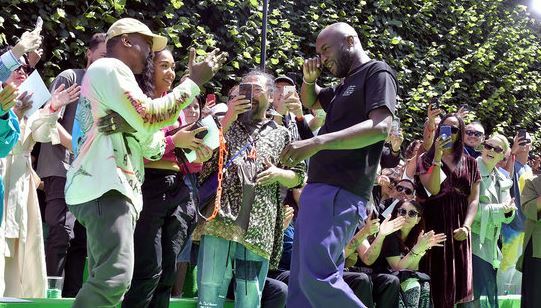 Kanye West and longtime friend, Virgil Abloh, shared an emotional embrace as tears rolled down their cheeks at the Louis Vuitton showcase on Thursday. Virgil was hired as the men’s artistic director of Louis Vuitton in March, but before then, he had been West’s creative collaborator for several years. As he was walking down the catwalk at the end of his debut Paris Fashion Week show, Virgil spotted West and pointed to him before sharing a sustained, emotional ‘bro-hug’. The pair could be seen crying as applause rang out for Virgil who had just showcased LV’s men’s spring/summer 2019 collection. Celebrities such as Rihanna, Kim Kardashian, Kylie Jenner, Travis Scott, and A$AP Rocky were present at the fashion show.